Having a baby, whether it’s the first or a subsequent baby, often marks a change in a woman’s career path. Sometimes a mom has only one option and returns to a previous employment situation and its preset schedule. Sometimes a mom has a few options, some with sacrifices in hours or pay. Other times there are many options. If working at home is an option, it’s one many families try very hard to make work. Naptime – now, if you’ve got an infant, you can sleep, too, OK?! Being rested may help make you more productive. But if you’re doing OK with night time sleep and/or your children are older, naptimes are when many WAHMs get BUSY! It’s important to be very intentional with this time. Some kids are predictable nappers and others are NOT. So…..
2. prioritize them. Put the most important ones at the top and do those first, at the beginning of nap time so that you’re more likely to finish them. 3. Put less important tasks or tasks that can be easily picked up again at the end, when you are more likely to be interrupted. 4. if something is VITAL to accomplish, have a plan B just in case there’s early waking. Night time – after bedtime is another work time for many WAHMs. Be careful! Don’t sacrifice too much sleep. Confession: as I got older, my night time productivity began to decrease. I just couldn’t focus as well at the end of my busy days. Grandma Day – if you are blessed with relatives nearby, you may be able to work in a predictable day when an Auntie or Grandma can hang out with your babes for a few hours. Never, ever take this for granted or be presumptuous when it comes to these precious days! Mother’s Helper – I was always on the lookout for a responsible tween (usually homeschooled for the hours I needed) who could entertain my kids while I was still home. I would shut the door to my work space if they were staying home to show that mom was at work. This can take time for everyone to adjust to but eventually everyone knew what to expect. A mother’s helper is usually a little cheaper than a babysitter because mom is still home in case she’s needed. It’s a great gig for a tween who is trying to mature into a full fledged babysitter. Preschool – once your child is old enough, preschool may be an option. My kids went two mornings a week. If I also had an infant, I would coordinate baby care or nap time as best I could. Usually I had a mother’s helper over during this time for infant care. For us, two mornings a week was a good balance between getting play time with others while not being too expensive. Babysitting trade – when I had my first baby, I traded babysitting one day a week with a friend I met in birth class. She went to a more traditional job and I went home to work! We both benefited and we both trusted each other. Babysitting cooperative – this is the previous idea taken up several notches! Several families work together to coordinate turns watching kids. Nursing times – I did this to an extent, but when mine were babies I had no tablets and no smart phones. Actually, I didn’t even have a laptop! So occasionally I put a nursing baby on the nursing pillow and did some computer work. But I assume you could do some research and simple online tasks while nursing. I caution you – do not let these screens impact your sleep. Baby wearing – if your baby is fussy and just needs to be held you may be able to get tasks done by wearing your baby while you work. This is how I managed to make dinner for a few years! Parent shifts – this isn’t new. For ages parents have taken turns with the kids. I never bathed my kids, but my husband did. There were many tasks he just could not do (mostly nursing, which took a lot of time), but he COULD bathe them. It was their special time. So every few days I got little evening reprieve while they all had splash time. That’s just one example. Many parents take very regular daytime, evening or weekend shifts based on their jobs. Freezer meals – yes, this is important to the work-at-home mama, at any stage. Reducing the time it takes to prepare dinner (while still providing wholesome meals) gives you HOURS back. Hours that can go toward working or other necessary tasks. Check out how you can reduce your dinner time cooking by HALF. Next Post:Why I Still Want a Landline – and you should, too! Seriously needed this! 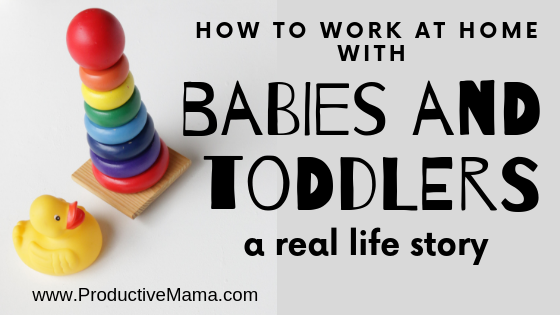 I am always trying to figure out how to manage my workload and being stay-at-home mom. Thank you for the tips! I’m so glad it was helpful. I plan to do a series detailing the different ages/stages of my kids and how I worked during them. So stay tuned! And if you’re not on my list over at http://workathomewith.productivemama.com, be sure to sign up!